In the past 3 years, we have handled the Amazon FBA labeling and prep of over 678,000 items. We started out as a used book online retailer in 2004, but in November 2011, we began to help Amazon FBA sellers with warehouse logistics. Our services offered include FBA product inspection, prep, labeling, processing, storage, and more. We can work with just about any product, and we still work with books as well. We can help a business model like yours by being a on-demand warehouse and labor solution. This way you don’t have to hire more employees or lease warehouse space. We make it easy for you to scale and grow your Amazon FBA business. We help international sellers expand into Amazon US, and we help domestic sellers grow their business as well. McKenzie Services is a family-owned and local Hillsboro, Oregon, USA company with 16 employees and 13 million in annual revenue. On the left (or above) is a picture of our 21,265 square foot (1,976 square meter) warehouse. We have two other websites (cash4books.net and sellbooksdirect.com). A reliable and trusted eCommerce merchant since 2004, McKenzie Services has been primarily known as Cash4Books and McKenzie Books. The Cash4Books side of our company has purchased over 2 million books from 250,000 customers and received national recognition. We have a 99% positive lifetime Amazon feedback rating, with over 244,000 ratings. The experience we have gained over the years, coupled with our outstanding systems and processes, has made us the best in the business—Amazon is our expertise. As we have gradually diversified out of the book business, these services were a natural progression for us. Our President and CEO, Jim Smith, is also an EO member. The Entrepreneurs’ Organization (EO) is a global business network of 8,000+ business owners in 122 chapters and 35 countries. Founded in 1987 by a group of young entrepreneurs, EO enables small and large business owners to learn from each other, leading to greater business success and an enriched personal life. EO’s vision is to build the world’s most influential entrepreneur community, which aligns with our mission of supporting entrepreneurial education and engaging entrepreneurs to learn and grow. 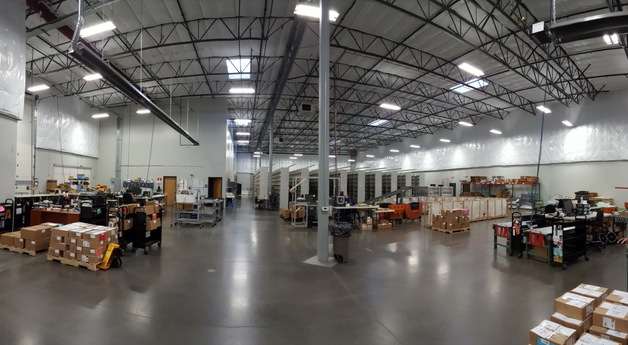 Below is a panoramic of the outside of our 21,265 square foot (1,976 square meter) warehouse. We are equipped with a loading dock for LTL or FTL truck shipment, as well as full container loads. Below is a quick 9 second pan of the south side of our warehouse, with McKenzie Services warehouse staff hard at work. Strive to be the best and aspire to the highest level of excellence in our service. Empower our employees to contribute and excel. Embrace change, drive innovation and promote excellence. Encourage bold and creative thinking. Be a team player. Participate. Support the goals of the entire team through daily actions. Kind, friendly, considerate, and open-minded towards others.